Advancing through the ranks in the push-up is fun and challenging. From slow and controlled push-ups from your knees, which helps you learn the movement, to high-flying and impressive full-body plyometric push-ups, there is plenty of room for improvement in your push-up game. If you want to build a fast, explosive upper body it's important to practice powerful, plyometric push-ups, according to a study in the Journal of Strength and Conditioning Research. Before you jump into this intense push-up workout, be able to comfortably perform at least 10 strict push-ups in a row. From that point, begin to incorporate some of these explosive push-up exercises, which are listed in order of their difficulty from easiest to most challenging. You can also do push-ups from your knees, which allows you to use a lower percentage of your bodyweight, according to an article in the National Strength and Conditioning Association's Performance Training Journal. The hop push-up is a gentle introduction to explosive push-ups. Perform two sets of 10 repetitions. HOW TO DO IT: Begin in a push-up position with your hands directly under your shoulders. Lower yourself down to the bottom of the push-up position, with your chest hovering right above the ground but not touching it. Press yourself away from the ground with as much speed and power as possible. Your goal is to not only come all the way up in your push-up, but momentarily leave the ground with your arms extended. It looks like you are doing a "hop" with your upper body. Once you can comfortably get some air during the hop push-ups, you are ready for another challenge. Try the clap push-up, one of the most intense plyometric push-up variations out there according to a 2012 study in the International Journal of Exercise Science. Perform three sets of five repetitions. HOW TO DO IT: Start at the top of a push-up position with your hands directly under your shoulders and knees and elbows completely straight. Lower yourself to the bottom of the push-up position with your chest hovering just above the ground. Press yourself up as quickly and explosively as possible so that your hands leave the ground. As you come up, quickly pick your hands up from the ground and clap them together in mid-air. After you hear the "clap," quickly separate your hands and plant them on the ground, preferably shoulder-width apart, to prevent yourself from falling. Once you are comfortable with your hands briefly leaving the ground and moving in the air you can try this move which involves jumping over an elevated surface using only your upper body. Perform three sets of five repetitions on each arm. HOW TO DO IT: Start in the top of a push-up position with your right hand on a medicine ball. The bigger the medicine ball, the greater the challenge. Perform a push-up by lowering yourself between the hand with the medicine ball and the other hand on the floor. In this exercise, you are lowering your chest to the height of the medicine ball, instead of going all the way to the ground. Press yourself away from the ground with both hands. At the same time, press into the ball with your right hand and launch your upper body to the other side of the ball. As you are jumping over the ball, take your right hand off of the ball and place it on the ground on the right side of the ball. At the same time, place your left hand on the ball and lower yourself down to the ground. Then press up and jump back to the left side of the ball, again switching hands. 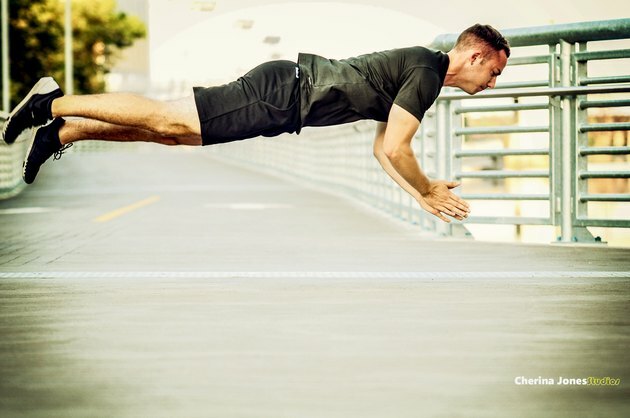 This is the epitome of the power push-up and, if performed correctly, will make you look like you can fly for a brief moment. Perform five sets of three repetitions. HOW TO DO IT: Start at the top of a push-up position. Descend into a push-up. Go down until your chest is hovering just above the ground without touching it. Push yourself up quickly and explosively as though you are doing a clap push-up. At the same time, kick your feet off of the ground. When you start to go airborne, bring your hands together quickly to perform a clap but keep your feet pointed up, ready to land from the jump. Quickly separate your hands and prepare to land on your hands and feet. Cushion the landing by dropping down slightly into a push-up position. Comparison of Dynamic Push-Up Training and Plyometric Push-Up Training on Upper-Body Power and Strength.